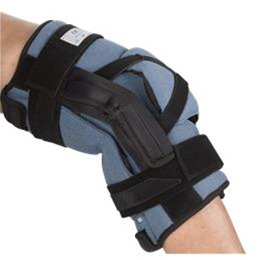 Ideal for pneumatic gentle stretch therapy to reverse severe (> 90 degrees) flexion contractures of the knee. The device can easily be applied to a flexed knee with the air bladders (2) deflated. By inflating the air bladders after the brace is applied, the pneumatic stretch will bring the knee into optimal extension while providing a therapeutic stretch to reverse difficult to treat contractures. The air bladder technology is also excellent for patients with spasticity. Orthotic therapy for severe flexion contractures of the knee (> 90 degrees), longer wearing schedules (bed bound patients), and for patients where brace application is very difficult. The OCSI Static Air Knee is a double upright knee orthosis with single setting hinges on each upright. The hinges should be set into 10 degrees of additional extension beyond comfortable end range stretch, so that when air is inserted into the bladders the knee can be stretched in 10 degree increments. Continue resetting the hinge 10 degrees ahead of comfortable end range to accommodate range of motion gains. 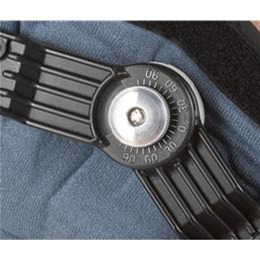 Pneumatic air bladders are enclosed in bladder pockets attached to the back of the brace. When inflated, the air bladders will provide a gentle Low Load Prolonged Stretch to the knee. An air actuator is provided with each brace, and is used to inflate and deflate the air bladders. An inflation / deflation nozzle can be found at the air bladder pocket openings at the distal ends of the air bladder pockets. Over time, increased knee Range of Motion should be evident, allowing for increased functional use of the affected joint. Functional use of the knee can be significantly improved by increasing ROM through the Low Load Prolonged Stretch provided by the device, allowing for greater independence in ADL’s. By increasing wearing time to three to six hours per use, the Total End Range Time (TERT) of device wear provides long effects stretch and permanent increases in joint range of motion over time. Orthotic treatment should be continued until function is restored to the affected knee. If function is not restored or significantly limited, the device should be used to maintain ROM as needed. Small OCS4080 12" - 15" 8" - 11"
Medium OCS4081 15" - 18" 12" - 15"
Large OCS4082 18" - 22" 15" - 19"